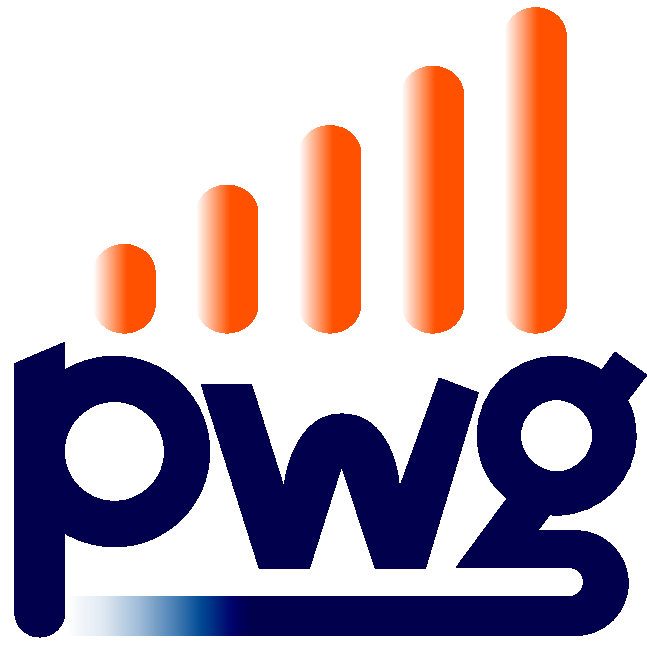 Prepaid-Wireless-Guide.com was inspired by my passion for prepaid wireless. Yes, believe it or not, someone can actually have a passion for this topic! I have many years of experience working in the wireless industry. I’ve launched too many products and services to count, and built programs that literally grew to manage tens of millions of dollars per month. And that's not because I'm any smarter than anyone else...I'm not, but simply due to being in the right position during a time of significant growth; truly exciting times to say the least! Virtually every topic you’ll find on this site is related to direct experience that I’ve had taking ideas from concept to launch. While I certainly don’t know all there is to know, I do consider myself to be a subject matter expert as it relates to prepaid wireless. I definitely don’t know everything, and find that I’m continually refining my knowledge and learning new things. Sadly, however, the bottom line is that I’ve seen people around me, including partners and vendors, with a lot less expertise, education, attention to detail, and passion get so rich. So I figured why not put energy into building my own business, where I can work hard and reap the benefits, without the risk of being laid off at any moment. Tired of answering to others? Are you frustrated with your job? Tired of working hard dealing with bureaucracy and lame people only to make others (ex. executives) super rich? Or perhaps you’re tired of your management not listening to your great ideas? Do you have dreams or visions of working for yourself, doing something you’re passionate about, and making a great living at it to boot? Well, you’re not alone. Sure, not everyone has the means, or inclination to setup a large corporation, round up vast amounts of venture capital, or manage production factories around the world; I know I sure don’t! ;-) However, using nothing more than your Brains And Motivation (Dr. Ken, the owner of Site Build It! Calls this B-A-M), you can build a solid and sustainable business; a real business. A business where you use your experience and knowledge to build highly valuable, and unique online content. It’s really important at this point to note that if you’re expecting to read on and learn how to “get rich quick,” you can stop reading now. The tools and process that I use, and I am sharing with you are not for the weak of heart. If you’re looking for an easy way out, or some mysterious Internet secrets that you can learn to get rich quickly, you’ll be extremely disappointed. The Site Built It! (SBI!) tools that I use require A LOT of work. The great news is that it actually does work. Or shall I say, if you’re committed to it with….B-A-M…. (Brains And Motivation), you can and will succeed. For me that’s what made it real. I know from experience that get rich quick scams are just that…scams. People who are successful have at least one thing in common; they work hard, very hard. Knowing that only those who work tremendously hard, and pour their heart and soul into it will succeed, is what gave me the confidence to start, and to stick with it. It’s very similar to getting a black belt in karate. After training vigorously at least three times a week for over five years, I earned my first degree black belt (shodan). I always thought it was so mystical and magical to have a black belt, and even people who learn of this accomplishment seem to feel the same thing. What I tell them though, from personal experience, is that anyone can earn a black belt. It doesn’t take any secret aptitudes or some special power to learn the skills to earn a black belt. But it does take a tremendous amount of commitment and hard work, and that’s why people say that only 1 in 1,000 people who start training karate ultimately earn a black belt. Most people quit soon after they learn how much work is involved, or they make excuses as to why they can’t spend the time training. And that’s ok, because everyone has to choose their own priorities in life, but the beauty of it is that anyone who puts they mind to it, and sticks with it, will succeed. I shared this story with you only to illustrate that succeeding with an online business is very much in the same spirit. If you think you can’t do it, you’re wrong; you can. You don't know what you're capable of until you try! So, if you have a passion, about ANY topic, are hard working, and can dedicate yourself to the process, then this tool is for you, and it’s worth your time to read on…. The concept is actually pretty straightforward, and I won’t go into all of the amazing features that are included, but rest assured that it has everything you need to build a successful business on the Web. Basically, start with a topic you’re passionate about. It can be absolutely anything, like travel, cars, sewing, camping, home building, consulting, gardening, flowers, chocolate, sky diving, cooking, computers…the list is truly endless! The point being that there are no limitations as to what topics can be used to build a successful online business. All you need is your interest, passion, and knowledge on a topic of your choice. If you already have a business (ex. dentist, lawyer, gift baskets, etc. ), you can also build a website to drive traffic to your “brick and mortar” business. Then enters SBI. SBI will help you organize your thoughts and topics within your area of expertise into a format that is appropriate for the Web. 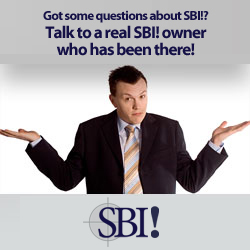 SBI does all of the Webmaster leg work, making it very easy for you to focus on your passion and expertise, and not a lot of time worrying about learning how to submit XML maps to the search engine so they’ll come spider your site, or HTML coding, or search engine optimization, etc. In fact, there are stories of Webmasters actually using SBI because it’s such a powerful tool that allows them to focus only on the things that are of the most interest to them, and that truly drive value to their site. Not to worry though. For those of you who DO want to continue using Dreamweaver, or whatever other Web authoring applications you like, you too will benefit from SBI and can use their tools to upload your own HTML. 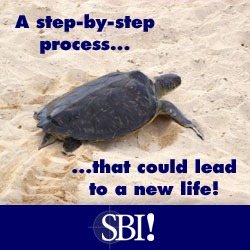 In other words, from novice to Web design expert, everyone can benefit from SBI. Even if the only computer experience you have is sending emails and searching the odd thing on the Internet, you can build a successful business online. The reason is that SBI isn’t about making flashy Websites, and trying to trick the search engines into listing you; but rather, it’s about providing real value to the Web. That is offering great content that others can read and enjoy. Google, Bing, and Yahoo quickly learn that your site is the real deal, and your traffic will build and build. You made it this far?! This is a pretty long page! If you’ve read this far, you’re probably saying to yourself: “Ok, this makes a lot of sense, but really, what’s the catch?” The fact is that there isn’t one. And there’s no magic bullet “build a business in a day, a week, or a month” pitch here. It’s about using solid, tried and true principles and tools, together with your B-A-M (Brains And Motivation) to build something real. I haven’t even gotten into the features like templates, reporting, tracking, the tremendously useful forums, the newsletter features, forms…the list goes on. You’ll learn all of that later. But rest assured that the price that SBI charges literally saves you thousands of dollars and hundreds of hours of work that you would be investing if you tried to compile these tools using other available applications and services. You’re more than welcome to try them out, but in the meantime, you’ll be losing valuable time building a real, sustainable, and valuable business. I think I spent close to two weeks thinking through my decision to start a site using SBI. I researched online and talked with friends. 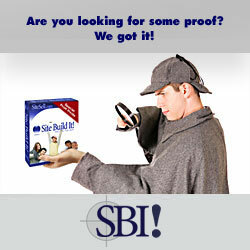 The great thing about it is that once you do decide to move forward, Dr. Ken of SBI does offer a money back guarantee, so at the end of the day, there’s no risk to you. You’ll try it out and either quickly learn that it’s not for you, or you’ll be so excited about your new endeavor that you’ll start plugging away at building your own business, and believe you me, you’ll never look back! If you have questions, you can click on the "got questions" banner below to send an email to Site Built It!, or if you'd prefer to talk to a live person, you can call 888-987-3669 (within North America) or +514-448-4573 (outside North America). I wish you all the best!